I have found a sure fire way to boost my morale during these politically challenging times. 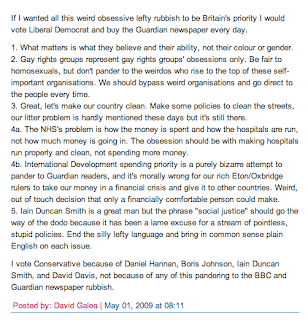 I stumbled across this post on Conservative Home, basically outlining how David Cameron will be doubling down on his efforts to promote the Tories as a reformed, modern party fit for 21st Century Britain. 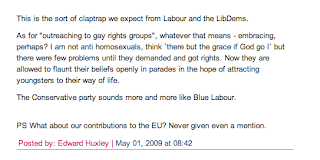 It happens to mention that David Cameron will be the first Conservative leader to participate in a gay pride event. All pretty straight forward (no pun intended) sensible stuff. Then you scroll down past the salesmanship of centrist Cameroonian rhetoric to take a look at what the online Conservative base says about these issues. 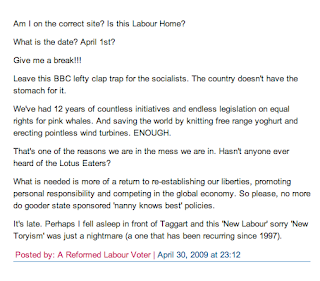 And to think that these people will form a base of people who are the Conservatives bedrock of support. No political party gets everything right but they tend represent, in a very general sense, the base instincts of their members and supporters. After all, this is what they are elected to do. So take a read through the thread. And then tell me things won't change under a Conservative government. thanks for shring your thoughts concerning David Cameron and his politics. custom writing paper can help you in modernisation your blog!